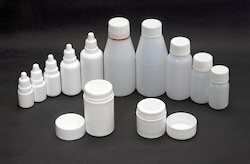 Manufacturer of a wide range of products which include hdpe bottle. Range 10ml bottle 30ml bottle 10ml bottle 30ml bottle Nasal Spray Bottle.Nasal Spray Bottle. We are manufacturing a wide range of HDPE Bottle. These are manufactured using the best quality material as per the latest industrial norms and standards. These are highly appreciated among our clients due to their availability in different sizes and superior quality. Additionally, we also assure safe and timely delivery of our products.